The artist Christo has an "irrational" urge to think -- and create -- big. "All our projects are absolutely irrational with no justification to exist. Nobody needs a Running Fence or Surrounded Islands." he once said. "They are created because Jeanne-Claude and I have this unstoppable urge to create." Though Christo's wife Jeanne-Claude, his collaborator since the 1950s, has since died, environmental artist Christo, 78, presses on, visiting the Westport Arts Center on Thursday to discuss his latest works in progress. Collages, drawings, films and informational panels arranged around the perimeter of the gallery detailed the grandeur of Christo's visions for "Over the River, Project for the Arkansas River, State of Colorado" and "The Mastaba, Project for the United Arab Emirates." The Westport reception drew a packed house, with many admirers standing by on a waiting list. In addition to food and wine, attendees had the opportunity to purchase one of several books about Christo, signed by the artist. "Over the River" will consist of fabric panels suspended horizontally clear and high above water level following the configuration and width and the changing course of the Arkansas River, and will be in place two weeks in August 2014. "Mastaba" will be a work of approximately 410,000 horizontally stacked oil barrels secured to an inner structure. The vastness of the setting will be reflected in the piece, which will have two 738-foot vertical walls, two slanted walls and a truncated top. Helen Klisser, the Westport Arts Center's director of visual arts, conceived and organized the show, and Christo himself curated it. "I've been thinking about this for a long time," Klisser said. "None of these things are instantaneous. The river theme of the one project and the center's proximity to the Saugatuck River was a prompt. Another connection was late Westport author Burt Chernow, who wrote a biography about the couple. When I was a director with Silvermine Guild Arts Center, I did a book signing with Chernow, so had already established a tie." Jeanne-Claude died two years ago from an aneurism. "I waited a respectful amount of time and approached Christo and his studio about six months ago," Klisser said. "Planning began immediately. He did a blueprint of how things would be set out in the gallery." 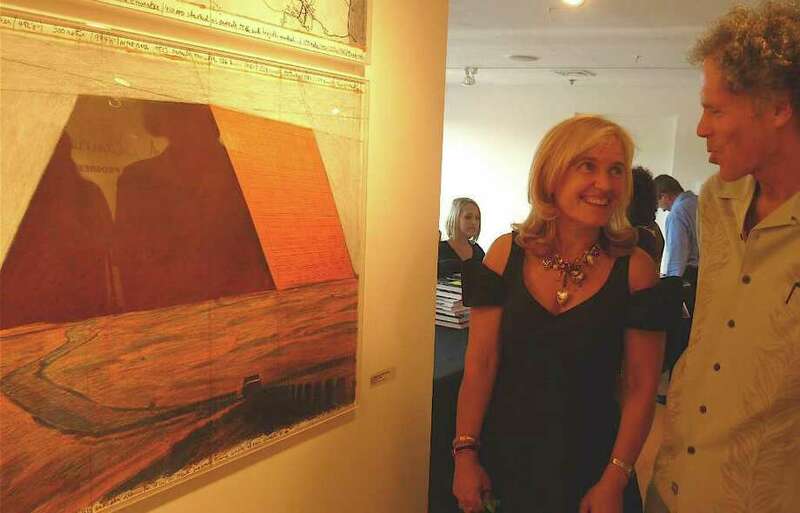 Chernow's widow, Ann, a Westport resident, was on hand for the opening of the Christo exhibition in Westport, and shared a few memories. "We met the Christos in 1970 when Burt went to ask them for a piece for the Westport schools' permanent art collection. This was around the Running Fence time. He gave Burt a piece. Burt came home and said, `He's a genius. This is going to change our lives.' "
The Chernows began working with the Christos on their projects, serving as greeters. "We were part of their army," Ann said. "Burt traveled with them often and came up with the idea to write a bio." In 1986, the Chernows went to Bulgaria to learn more about Christo's roots. They were there a month and followed everywhere by KGB agents. "From 1986 to June 9, 1997, Burt spent four to six hours every day at the computer writing the bio, titled `XTO & JC'," she said. "It was released in 1999 in Germany. If Burt had still been alive, he would have continued documenting their projects." Westport artist Miggs Burroughs was intrigued by the works. "Conceptually, Christo is grand and challenging and wildly unrealistic, but makes these great things happen," he said. "He's inspiring because he dreams the impossible and does it." Another local artist, Alyse Rosner, was amazed by Christo's preparation. "He must have an amazing grasp of spatial relationships," she said. "There are so many technical details involved." New Canaan resident John Tremaine, an exhibit sponsor, said he had the privilege of unfurling one of the curtains of "The Gates," a Christo installation in New York's Central Park. "The curtain was held in place with a Velcro wrap," he said. "It started to flutter and take life. It was not a simple project. It was art and high-tech engineering." Westport First Selectman Gordon Joseloff was among the attendees who also had seen The Gates. "Christo has been to Westport before -- it's a thrill to have him return," he said. "This is another indication of how well regarded Westport is in the art world." Dale Najarian, an arts center board member, said The Gates made her a Christo fan, but she hadn't previously seen any of his sketches. "You get a very intimate idea of what a project is going to be like when it's complete," she said. "His sense of perspective is unbelievable. His work is larger than life."